It’s no secret. We all want the perfect landscaping and lawn for our homes. A great, lush, dense lawn makes a statement, adds value to your home, and becomes an enjoyable outdoor space for you and your family to enjoy year-round. A dense, green, vibrant lawn is certainly achievable, but it will take some effort. A short cut is to enlist the help of Wheaton, Illinois landscaping firm, Schmitt’s Landscape Company. Our Bio-Friendly Blend fertilizer will ensure your grass is nice and thick. The following is an overview on how Schmitt’s Bio-Friendly Blend fertilizer and some of the more common pelletized compost products can help you reach your goals. Although pellet compost can be a bit pricier than normal compost options, pelletized compost is easier to apply and provides some additional benefits as well. When parts of your lawn are thinning out more than the hair of Seinfeld TV sitcom character George Costanza’s head, it’s time to take action. Often times, thinning grass and spotty patches can be due to bad soil conditions, poor composition, and poor fertilizing. In some situations, aerating your lawn can help to relieve soil compacting, thus improving growth conditions. Lawns with soil that contains large amounts of clay can become compacted again, causing the soil to become a poor environment for grass roots and the health of your lawn. Sometimes poor soil conditions worsen over time. In an effort to improve soil conditions, additional steps can be taken, such as adding compost. Composts come in many forms and varieties, which can make selecting the appropriate compost for your situation difficult. These can include both organic and non-organic varieties. For additional help, be sure to contact Schmitt’s Landscape Company. As you can probably imagine, different types and formulas of compost and fertilizer will have different results for your lawn. In addition, the specific type of grass will also impact what will provide optimum results for a thicker, denser lawn. Soil type also plays an important role. You’ll want to make sure that whichever type of fertilizer or compost will produce the results you are looking for and provide the proper nutrients your lawn needs. If your green thumb has turned brown, you may want to seek out the help of a professional lawn care and landscaping services company. 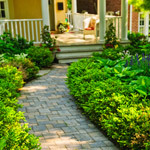 Schmitt’s Landscape Company of Wheaton, IL has been providing Glen Ellyn landscaping services and comprehensive lawn care and maintenance services for over 35 years! We’ll help you achieve the beautiful, dense, lush lawn you’ve been striving for. You will be amazed at how beautiful your lawn looks after the proper application of a Bio-Friendly Blend of fertilizer or compost.